For this seventh episode, I had a chat with Russ Heddleston, Co-Founder of DocSend, the leading document tracking company. After growing up in South Dakota, and prior to starting DocSend, Russ had quite the track record. He worked at Microsoft, Dropbox, and Conversant. And he sold a company to Facebook. I first heard about Russ and DocSend when he was featured on TechCrunch. During our chat, we talk about what TechCrunch meant for him, building a great product, how to hire a VP of sales, and how he refused to join the Bachelorette when starting off with DocSend. Jeroen: Hi Russ, it’s great to have you on Founder Coffee. Russ: Thanks Jeroen. It’s great to be here. Jeroen: You are the Founder of DocSend. For those who don’t know about DocSend, what does your company do? Russ: DocSend is in many ways just a nice way to send links to attachments and see who’s reading them and where they forward them. A lot of Founders use it for sending out their pitch decks, but most of our business comes from sales marketing teams. They use DocSend to manage all their assets, to track what people are using or not using and seeing how they’re performing out there. Jeroen: So it basically gives you visibility on the documents you send and how people are interacting with them? Russ: Yeah, exactly. Because there’s a big correlation between how people engage with the content you send them and if they’re going to do business with you. In other cases, it’s also the security of documents that people are worried about. ‘Don’t forward this to others’. And then in other ways, it’s just a very easy way to find and send things, in DocSend. So there’s a lot of convenience baked into it as well. Jeroen: What are some of the common success stories people have with DocSend? Russ: There are probably a few flavors of success stories that people will have. Now because they were selling advertising, they knew that there was a client out there, a brand wanting to buy that ad space. So she could see who at the brand read through it and so she called them up. When she showed up for the pitch, she already knew who around the table had read through her proposal and for how long, because DocSend will actually show you the name and the LinkedIn profiles of the people who are reading the content. So she actually already knew how to work through the pitch and she simply addressed all the questions of the person who had read it the most. That person then sold it to the rest of the room for her. It’s a great, great story! But one of the earliest success stories for me, was sending off one of our first DocSend links to a potential investor. The very first page of the deck was the founder page and I have two co-founders who all went to Stanford in computer science. So we’re a good founding team. And it’s like, there’s no way you could know what we’re working on. It’s very ironic that the first time I sent a DocSend, I caught someone in a lie. But what was more important was that he did forward that link on to one of his partners at the firm. But when I caught up with that person, they thought it was a pretty funny story as well. Jeroen: Yeah, that’s funny. So you mentioned you all went to Stanford. Did you start this right after university, or did you do something else in between? Russ: I feel like I’ve done a lot of things in between. So I’m from South Dakota originally, and came out to California for college. I wasn’t into software engineering before because South Dakota doesn’t really have any of it. It’s more like a farming state. But Stanford’s great for computer science and there’s this whole ecosystem of companies there. So I got swept up into it. But I’ve worked in a bunch of companies over the years. I was a 2006 undergrad at Stanford and I did a masters there as well. I interned at Microsoft while I was an undergrad. I also interned at Trulia when there were only five or six people there, Osami and Pete. So I got to see that. I was there for six months as a software engineering intern. Then I ran engineering at a company called Greystripe for a few years out of Stanford directly, a mobile ad network that got bought by Valueclick and got rebranded to Conversant. I was actually out at Harvard Business School, and interned at Dropbox. Then started another company called Pursuit, that was talent acquired by Facebook and after that I left Facebook to start DocSend almost five years ago. So DocSend is definitely the longest I’ve actually worked on anything in one continuous span. Jeroen: So did the spark for DocSend come when you were at Facebook? Russ: No, when I started the last company Pursuit, I think we jumped in a little too quickly. I also had two co-founders who are awesome guys, Nick and Louis. Both of them are software engineers are from Trulia, actually. We basically, a year into it, realized some stuff that we should’ve thought about at first. So when starting DocSend, we actually spent quite a few months interviewing people and researching it before we started the thing. The original inspiration was really to get rid of attachments, because historically, there were two use cases for attachments. One was, I’m going to email a thing to you so you can edit it and send it back to me. Then Dropbox, Box and Google Drive came in. Those solutions got rid of that by putting in this collaboration layer. I love Google Docs, it’s awesome! You don’t have to go back and forth in attachments, you can work on something collaboratively, it makes sense. But the other use case for attachments is sending them externally to people when you’re not collaborating and just need to explain something. It’s better to send a deck or a video or some reusable asset. So DocSend was really trying to get rid of that use case. It’s frustrating to see how many attachments are sent when there are just hundreds of ways to not send an attachment. And so that was a fun research trip, basically. I did my masters at Stanford in human computer interaction. It was actually a really fun degree, and one of the mantras that they have, or at least that I took away from it, was that there’s lots of software. Software behaves exactly how you code it. It’s getting adoption of the software and are you solving a real problem that’s much harder. That was definitely the case with the problem that DocSend is solving now. It’s like, yeah, sure, there are other solutions. But the question is, why aren’t they being used for this? And so, that’s the research that we did before jumping in and building enough conviction to want to build out DocSend completely. Jeroen: In terms of adoption, I remember reading about you guys. The first time was sometime in April or May 2014, on TechCrunch. Did that feature make a big different to your growth? Russ: TechCrunch is wonderful, and that was some good public speaking practice for me, but no. That didn’t really make an impact. I’m not sure what types of businesses TechCrunch makes a big impact for. I would imagine consumer brands, things that are more media-oriented. Before launching there, you couldn’t sign up for DocSend if you wanted to. So we were forcibly holding back growth. One of the other reasons for that is that having DocSend perform is very important, and if your DocSend link doesn’t work as well as an attachment, then you’re just going to go back to the attachment. So we really spent a lot of time building out our solution before we let people come into it. And then we launched it at the TechCrunch battlefield. We did see a spike in signups after that, but they weren’t really quality signups. The product itself has spread way more awareness than any sort of publicity could. So when you look at the signup graph, you do see a spike, and then you see it drop down again. But then you see it steadily yet quickly climb way past that spike. So I wouldn’t recommend against it. I think it was still something good to do. At least from our experience, it’s not a make or break the company type of thing, which is what they’d like to have you believe. But it’s still a really fun event! Jeroen: But you saw a higher adoption after the feature. Right? Russ: It was a spike that basically dropped to the baseline. It did go up a bit, but it wasn’t as much. If you got organic growth to your company and you do a big marketing stunt, you can think of it in terms of how many months of signups is that. Or ideally, would it actually change the slope of the growth graph. For us, it didn’t. You couldn’t sign up before that, so we’re not sure what the baseline would have been. But most of the people who came in and checked out DocSend left again afterwards and didn’t become customers or even regular users of the free version. A lot of the usage, and best use cases for DocSend, has come from word of mouth. Jeroen: So it has a viral aspect, I guess, with sending out the attachments. Russ: That’s right, yeah. There hasn’t historically been a big PR strategy for DocSend in general. It is kind of tough for B2B companies to have a PR strategy. We’ve done some research on what has worked out well for us and I don’t think features really impact growth. But we’ve got a couple more coming out in the next few months. That’s the best thing I’m able to do for PR. Jeroen: Spitting out some numbers about how many people are reading what and what works, right? Russ: Yeah, it’s actually fascinating stuff. If you’re a product marketer and you’re trying to create content for your sales team, the sales team never tells you what they need. They tell you what they think they need, but you’re the product marketer. So it ends up being in this data-free zone that is very frustrating. So bringing research in, I get a kick out of it, because it really is about sharing knowledge independently. If you use DocSend or even care about DocSend or what it does, knowing these average stats around how long should a case study be, how often is it read, how many people are reading these things, are they worth producing; it answers questions that make you better at your job and that makes me happy. It also has the added benefit of having a little DocSend logo in the asset that the research is being centered around. Jeroen: Back to your backstory. You mentioned you grew up in South Dakota and then you made it to California. Was that because you wanted to start a company, or was it just because you thought of going to a good university? Russ: Well, my family was in the military while I was growing up. So I was actually born in San Francisco, lived there for a month or two. Then we moved to Berlin for five years and Denver for five years, and then finally to South Dakota. So I didn’t really have any allegiance to the state. I was probably going to go somewhere else for school anyway. And in retrospect, I’m very happy that I went to Stanford. It’s just a wonderful network and it really took me outside my comfort zone. Not that many people from South Dakota go out to Stanford, so I didn’t know it was a thing at the time. Jeroen: Talking about brand education, do you think it’s a good idea if you want to go into startups to go to Stanford, because you build up a huge debt, I guess, student debt? Russ: Yeah, the student debt stuff is really scary. Well, Stanford specifically, there’s not really as much a concern around that. If you have an endowment and you’re a non-profit like Stanford, you have to spend 5% of your endowment every year to continue to qualify as a non-profit, which is very important for these schools’ endowments. I don’t know if it was specifically because of this, but Stanford basically needed to spend more money to make sure they were spending 5% of the endowment every year. In any case, what they did do and what’s still in effect there, is the need-blind admission. So if you can’t pay for it, they actually do a very good job of just not charging you for your education there, because they really don’t want to saddle students with huge amounts of debt. That’s definitely not a standard thing, so I don’t know how many other schools do that. It is a really wonderful thing that Stanford does, and that actually allows them to have a really diverse student body. But yeah, for anyone out there, if they’re wondering about, should I apply to Stanford, is it worth it if I want to be an entrepreneur someday, I would definitely say apply to Stanford no matter what you want to do someday. Even if your parents have no money and you have no money, they will definitely work with you to figure it out, if you’re able to get in. The Onion had a really good post a while back. Being a joke news network, they’re like, “This year, 0% admissions to Stanford.” Seems like every year the admission rate goes down a little bit! Jeroen: Talking about a network, which other known startup founders went to Stanford that you met through that network? Russ: Well, Stanford’s not huge. But we have 1,500 graduates a year from there. A lot of the people that I know best are through a program called the Mayfield Fellows Program. They have just 12 students a year, and it’s basically just a work study entrepreneurship fellowship run by Tina and Tom, and they’re fantastic. So at the time when I graduated in 2006, there weren’t a lot of alumni that had started successful companies. But since then, it’s actually really turned around! Maybe the most famous example would be Instagram. The co-founders were both alumnis of the program, Mike Krieger and Kevin Systrom. So Mike Krieger and I had some classes at Stanford together, and I knew Kevin at Stanford. It’s awesome to see how well that’s done! And then Steve Garrity and Clara Shih started Hearsay Social together. That one’s done really well. There are a lot of them. More recently, Katrina Lake started Stitch Fix and that’s been doing really well. At this point, there are just dozens of friends of mine from Stanford who have started companies. Harvard surprisingly is actually doing quite well on that front also. More and more so lately, a lot of HBS, Harvard Business School alums have been often starting things, even though the general stereotype is that HBS alums only go into investment banking and consulting, they have been diversifying lately. Jeroen: That’s a good thing, I guess. Russ: It’s nice to have a network out here in San Francisco. Jeroen: Yeah. While building DocSend, were there any startups or founders that you looked up to? Russ: Oh, yeah. There’s so many different examples. Certainly like Salesforce and Marc Benioff in terms of creating a great B2B company. A lot of the things he did were just so smart early on and continuing to build that out, was just so impressive. While I was working at Facebook, Mark Zuckerberg’s incredibly impressive, and for the product that I was managing at the time, Pages, I would go to reviews with Mark and also with Sheryl Sandberg. Just spending even a small amount of time with them was just very impressive. The way Mark was able to run Facebook was very inspiring and a great model. Even if you grow a company to that scale, how do you still connect the dots and make everything work together smoothly and have the whole thing make sense? I could go on and on, but yeah. No shortage of inspiring startup founders and company leaders. Jeroen: Yeah, for sure. Talking about Salesforce, are you also following the predictable revenue methodology, then? Russ: Oh, the Aaron Ross’ Predictable Revenue methodology? I read that a while ago. Since I can’t say yes for sure, the answer is probably no. But the predictable revenue side, remind me real quick, which aspect of it were you thinking of? Jeroen: The part about splitting out different sales jobs, having SDRs, etc? Russ: Oh yeah, exactly. And the hunting, nets versus spears. Russ: Well, we basically have two businesses. One is inbound and self-serve, and that’s a great business. There’s really no cost to acquisition, just because DocSend’s a really easy to use product. It does what it says it does, and that is great as a business. And what that really costs us to do is just building a really usable self-explanatory product. But then the other part of our business is the predictable revenue outbound model. We do have a BDR team, we call them business development reps, and they have target accounts. So we have a lot of large brands that use DocSend, and then in calls, they’ll reference them. They’ll just call up their competitors and say, “Hey, here’s how Forbes is using DocSend. How do you guys manage content that your sales team is using?” Or whatever. And so then they’ll get interested and then set up a demo. It’s usually more like a discovery call at first, just to figure out what is their business and how DocSend would fit in. Again, coming back to the HCI concept — software does exactly what it’s supposed to do. The question is, is it going to be adopted and solve a real problem? So we always try to make sure that DocSend’s going to be useful at a company before we try to push it further. That’s another thing I’ve been surprised with — the sales teams that we work with. It’s very important not to sell what you do to a company that doesn’t appreciate it, even if you can sell it to them, because it’s going to show up as a churn rate later. And that’s really bad! Especially as a startup founder, you want to pick your customers carefully so they stick around for a long time. If you pick your customers poorly, they might churn, but they also might ask you for random stuff that you don’t want to build, and it can drag you in a variety of directions. But, yeah. I think the Aaron Ross book, the Predictable Revenue stuff, is great. We work with so many sales teams just through DocSend that it’s just very widely used now as a standard setup for a team. It’s also a great feeder program to be able to bring in people right out of school, train them on something, and then have a ladder ahead of them where they can climb the ranks and eventually be a CRO. Jeroen: You mentioned you have two sides to the business — let’s say, the pure sales side, and the pure marketing side. Do you find having these two sides of the business easy to combine? Having the self-service side and the more guided sales side for businesses? Russ: I think the conventional wisdom says that it’s a bad idea to have both, or at least that most big companies start off with one, and usually have one that’s primary. If you want to take Box and Dropbox as examples, Box has been primarily outbound sales focused, more on enterprise deals, and Dropbox has been primarily inbound focused. They two have both business models, but I don’t know what it is from the filing for Dropbox. But my guess is, it’s probably 90% self-serve revenue, and 10% sales-driven. Which, if they’re at $1 billion, there is still $100 million from the sales team. But they really nailed one business model, and then they added the other one on later! So for DocSend, it’s still majority inbound. I think that there’s a good chance that, that ends up being the predominant growth mechanic for us, but having an outbound sales team is something we’re going to have to do anyway. For us, they’re almost competing with each other, and the nice thing is that underneath them, the technology we built is just the same thing. When we try to roll that out there, a lot of the stuff that we built for self-serve ends up being very helpful, because for those end users, it just makes sense. It’s just really easy to use DocSend. So, almost everything is overlapping between the two. It’s really more of a pricing and packaging issue. Jeroen: Okay, so you don’t feel like you have to split yourself up or something. Russ: Yeah, exactly. Do you, for your business, is there a primary growth mechanic? Is it mostly inbound or is it typically more outbound? Jeroen: It’s inbound for us. We don’t do sales, as we focus on small companies. It’s mostly tech startups, and on the other hand, digital marketing agencies. So we don’t do sales. We have someone on support which is partly doing sales, but real outbound sales is not a thing for us. Russ: Got it. It’s great, cost to revenue is definitely higher for outbound sales. And it naturally drags you up in the market. Talking to larger and larger companies, and selling a million dollar deal. Yeah, It seems to be part of a company’s DNA that’s set relatively early. Jeroen: Yeah. We just find that the market for small companies is quite underserved. Most of our competitors like to go upmarket. We really focus on small companies, on making it practical for them and making it very easy to use. Software that doesn’t require a lot of updates, like data input. That’s been our focus, and we’re not really planning on going upmarket anytime soon. It’s all going to be inbound marketing! Russ: Speaking of another company with a great story, Gusto, and Josh Reeves is the CEO there. He’s also another Mayfield Fellow and Stanford alum. They had a great strategy to take the upper part of the market. The lower part of the market’s really underserved. So they built a wonderful and quite a large business by just doing SMB, payroll and all of the related functionality around it. Russ: But they very intentionally have not gone to upmarket. So you get to a certain size, you just graduate off Gusto. But at least for them, they can build something that is wonderful at what it does, and it doesn’t have to do everything. They can go to upmarket later if they choose to. But making a business for the part of the market which is just very underserved, is a very smart way to go about building out Gusto. Russ: Yeah, we get that occasionally as well. Then we just come back saying, “No, we don’t do any of these things. But we do these other things that you didn’t ask about, and they’re important.” And sometimes people come back and just basically change their criteria, because sometimes people think they want things they don’t. Jeroen: In your case, are there any solutions that are more fit for the ‘up’ market companies, or are you the only one in this space? Russ: Well, we’re not in a space. It’s not a space yet. Content management has been historically super fragmented, and also just super slow to change. It has always been attachment based. So if you look at EMC or OpenText or something, or even Sharepoint, we see Sharepoint all the time. Sharepoint does a lot of things really, really well. But it hasn’t changed in a while. I think DocSend is basically kind of a thought exercise. If we don’t need to send attachments anymore and we can just send links to everything, is that better or worse? If it’s better, what else can that change for businesses? I think at least our customers are realizing that there’s a lot of information stored in that content. In terms of who’s reading it and how it’s performing, and then there are just a lot of persistent problems that pop up in the content management land, around version control and finding things. So we actually can solve a lot of those problems for companies in a pretty unique way. But if you’re talking about sales and marketing teams, Gartner has a report on the sales asset management space. But it’s not an especially large space and most of our revenue doesn’t come from companies that think of DocSend as a sales asset manager for their business. So I think we’re definitely in a stage where we’re defining our own space. There are some larger, old companies, like Salvo that are still mostly attachment based. Jeroen: So talking about space, where do you see your ambitions? Which space are you trying to carve out? Russ: Well, there are all these historic examples of companies that are able to define a new category. So for DocuSign, carving out like digital transaction management. Coming up with marketing and defining the space, because before that, the signature wasn’t a space. It wasn’t a thing. And today, we had to create the space! I think there’s a good chance that there’s something like that, that DocSend needs to do to define the space. But for me personally, I think I’m mostly a product person at heart. I really like solving problems for companies, especially if they’re problems that just aren’t solved by other solutions out there. And doing so in a way that makes sense and is very sticky. I just love seeing people use our software. Probably similar to how you’re thinking about things for your company, Jeroen, around building something for an underserved part of the market. If you do that well, you actually do get a lot of inbound and word of mouth, and that makes for great business. Jeroen: Yeah. Talking about managing and building a product, is that what keeps you up at night lately, or are you more busy with other aspects of the business? Russ: No, we have an awesome director of product management, Justine. So I leave that completely in her camp. I try to make sure I bring her all the information from the market that I can, so I’ll do quarterly meetings with our marketing, sales and customer success teams, and try to put all of their feedback together in one spot and rank order it. I try to make it a little bit more data-oriented, and then present that to the engineering and product teams. This way, they can make the best decision based on that information. If you’re self-serve and inbound, and that’s 100% of your business, it’s a very different process for synthesizing information for the market and building things based on that. Like, okay. It’s like, is that really what we should bet the company on? So that’s worked out well for us. Just like a product process, because whenever someone says blah blah blah, maybe blah blah blah is really important. But you want to actually take a look at how many times it’s been seen, what were the size of those companies, how important was it to them, and then try to tease out the rank ordering of what you might want to build. I spend more time stressing about people, process and growing DocSend. We’re right now in the process of promoting BDRs up through the ranks. But in order to do that, you have to build the ranks. You have to define them. What is this new role, how does this new role work, who are you going after? What’s your goal? Do you have a quota? There’s so much complication to having people in roles and trying to build out a lot of that structure, takes a fair amount of time. Jeroen: Yeah, it sure does. So you’re building the organization and spending time on hiring right now? Russ: Yeah. There are some roles that we’re hiring for. We have an in-house recruiter, who helps a lot. I think, I would be curious to hear if you feel the same, but I feel like starting a company, as you build it out, you’re just basically making yourself obsolete over and over again. Which is great! Jeroen: Yeah, that’s what I keep doing as well. But after a while, you start wondering, what am I going to do in the end? For instance, I started pretty much on the product, marketing and sales side. Then I did customer service, and while doing all of these things, I started to delegate them step by step to someone who can do it better than me. Then again your role evolves. I think, you’ll always need to adopt your new role, try to do it as well as you can and then go for the next thing. And that’s really interesting, I think. I don’t know how you feel about that! Russ: I love it. I wouldn’t have it any other way. I find that the areas that I know the most about are the ones that are easiest to hire for, or even promote people into the role, because I know how that role works. In the areas where I don’t know a lot about the role, then that can get really tricky. Like, we hired a VP of sales a few months ago, and I had never worked in sales. I’ve never had a quota. So with DocSend, we had inbound, but there were slightly larger deals that we were required to sell to. So I would go and do that part. But then I realised, I can’t be doing that all the time. We’ve got to hire a couple of salespeople! So I hired salespeople, and then managed them for some period of time. Then I felt very incompetent doing that. But then bringing in a sales leader, it was a role that is very important, and all the people that I’ve talked to and asked for advice on this front said, “Oh, it’s never going to work out. We’re on our third VP of sales, but I think it’s really going to work this time.” So for that role, I decided that I would just hire myself for the role by doing it for a while. I did it for a while and really gained some empathy for what the role is. Then I interviewed a lot of VPs of sales even before we actually hired one, just to meet them and figure out how does the process work, because there’s so many different flavors for the role. It’s enterprise versus transactional inbound versus multi-decision, or multi-stakeholder; it’s just very nuanced in a way I didn’t appreciate. So when we were finally ready to hire a VP of sales because I felt I had reached my level of incompetence trying to manage a bunch of sales people, I actually had a pretty good idea of what I was looking for. That really helped in the search for the role. Hiring, especially leadership, is incredibly time-consuming, because the cost of getting it wrong is huge. But from an opportunity cost perspective, as well as from a how much money you’re spending on it, if you’re using an agency or you’re doing a retained search, or … Ugh. So people are incredibly important! Russ: I imagine for you as well, it’s the people that matter a lot for sales? In terms of hiring the right ones? Jeroen: Totally. We’ve made mistakes before and then we revised the hiring processes to really make sure that we hire the right ones immediately, because otherwise you lose so much time. While you should be building the business, the team grows and contracts again, and then you need to start all over. Also as a founder, sometimes you need to go back and pick up the role again while you’re actually planning to do other stuff. Russ: Yeah, couldn’t agree more. Jeroen: What are the main skills you, as a founder, bring to DocSend? What do you think is really the thing you excel at within the company that makes it grow? Russ: Well, coming back to the theme of making myself routinely obsolete, it’s probably not a good thing if, as a founder, I was the only person in the company who could do something and was instrumental at doing that thing. Without me, the company would fail.There needs to be some redundancy, and then just from a personal happiness perspective, I definitely don’t want to be in the critical path of anything. I would much rather have someone else be doing that. So over the years, I’ve become good at a lot of things. I’m probably not great at many things still! But having a relatively wide skill set in itself, can be something of a rare thing. So for right now, probably the most important things I do are really just helping the team work together, make sure things are working cross-functionally as they should. Certainly, representing the company through partnerships or going to conferences or meeting other people is a part of the role. That’s just something I enjoy and am good at, and people respect the role that I’ve got at the company. Well, we did the last two research reports with the Harvard Business School. That was from my connections there. It was going in and talking to my old professors and getting them on board, and getting that piece together. That would definitely fall in the marketing pocket, but I’m definitely not running marketing for DocSend. But that was actually very successful for us in identifying that, and spending a bunch of my time on it to make it happen. And then we’re also doing another research report. This time with an agency called The Starr Conspiracy, out of Texas. I met them and had a great conversation, and so we’re sharing the burden of putting together some research in a new report. So things will come up like that, where I’ll put in time. But it still ends up being a smattering of time across a variety of areas. Is there a particular focus for you at this point with Salesflare? Is it 100% sales or 100% fundraising, or recruiting, or product? Jeroen: For me right now, it’s marketing. That’s the main thing that needs to improve right now, so that’s where I spend my time, and that’s a recurring story. It’s always about where we need to improve. I would always jump right in. In soccer, you would call it the liberal, or something. The guy that picks up the things, picks up the ball where it’s left. Russ: Well, someone’s gotta do it! Jeroen: Yes! So if you go on vacation right now for a few weeks, do you feel like you can leave everything, or are you still really needed anywhere? Russ: I think things would run a lot better than I think they would. I wouldn’t say this, but you kind of think of yourself as being important or instrumental, or how will they get by without me? It’s probably just not true. So, yeah, I could definitely go on vacation for a few weeks, and I think everything would be running just fine. But there are things that require proactive time or they just won’t happen. So I would probably not take off for a few weeks — I haven’t done so for quite some time, because there’s always some project I want to get done. As I was describing before, the people matter. What does the promotion ladder look like for junior salespeople at DocSend? And our VP of sales has a lot of stuff going on, but it’s really important to me to make sure that the first BDR we promoted, is successful. I have been proactively spending a lot of my time on understanding the role and the processes, because a lot has to change. So just making sure that goes well, because if that went poorly, then that would actually be a pretty big problem. Coming back to your question of leaving for three weeks — as long as there is nothing during this time where someone needs help, nothing that is falling through the cracks or there is someone covering it, you’re good to go! In this case, it has been fun to jump in and spend more time making sure things work. It takes time off the VP of sale’s plate. I can contribute in this way, which is good. Is it similar for you guys at Salesflare? Would you actually be able to take three weeks off? Jeroen: I did so over the festive season. It was with Christmas and New Year, but it was actually the first time that I felt like, okay things are running without me, because I’ve outsourced most of the operational things. So that was a really good feeling! I called my sisters, told them what happened and burst out laughing. She’s like, “Yeah, I sent your application.” That’s when I actually thought if I could take three months off or something. Or is it just too long? So three weeks, I can make that happen. But three months, no. So I did not go on the Bachelorette! Jeroen: Do you have a wife and kids now? Russ: No, I’ve got a girlfriend who’s awesome. We’ve been together for a few years. But not quite to the kid stage of life. Jeroen: How do you manage the work-life balance? Russ: That part’s been actually great. 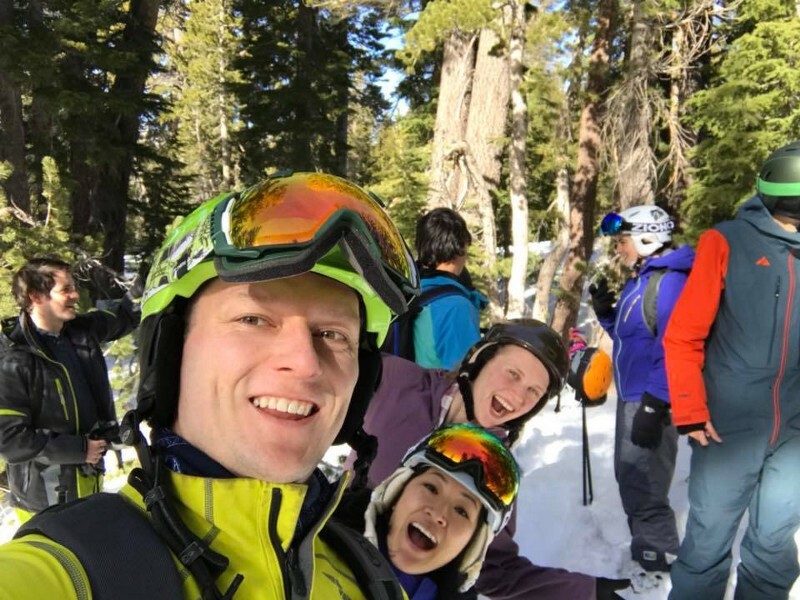 My girlfriend works at Pinterest as a data analyst, and last weekend, we were in Sun Valley, Idaho, which is great for some skiing. I hadn’t been there before. We’re going to go to Japan for another friend’s wedding in a few weeks for nine days, which is great. So we usually have a trip a year that’s at least 9–10 days together, and go run around somewhere. We live together as well, which has actually been awesome, especially for time management, kind of crazy to think about the whole commuting to see someone thing. So yeah, it’s actually been great. We’ve been able to make it work really well. Our jobs are relatively flexible, too. Like, if I’m out of the office early, we’ll just spend a couple hours or whatever doing some work sitting together, and then we’ll go off and do an adventure for the rest of the day or something. Jeroen: Do you have long working hours? Russ: They are pretty long working hours at this point. But that’s okay, because I enjoy it and it doesn’t cut into other things that I would like to do in life. Trips or travel or that sort of stuff. So I definitely enjoy it! I would much rather work more hours on something I enjoy than fewer hours on something I don’t. Jeroen: Yeah. What do you like to spend your time on when you’re not working? Russ: Both my sisters live in San Francisco. So we get to meet up quite a bit, and we’ll go swimming in the Bay together, which is actually a really nice way to just de-stress and get into a new environment. It is chilly, but it’s not as crazy as people think. There are a bunch of 80 year olds that go swimming in the bay every day, and if they can do it, anyone can do it. And then, we go do triathlons or races, or just go and explore various places. That tends to fill up a lot of my time. I’ve got a lot of friends who are here in San Francisco, just between all the different companies I’ve worked at and between different places I’ve gone for school. So there’s just never a shortage of parties and birthday parties. I keep a full social calendar! Jeroen: Where are you living in the Bay, exactly? Russ: We’re in San Francisco, in the Mission district. Jeroen: Is that in the center? Russ: It is, yeah. It’s really close to the BART, the transport here. So it’s 15 minutes for me to get into the office, and our office is in the financial district, which is actually really nice and clean, which is great. And San Francisco, in many areas, is pretty dirty and unsafe. About half our company are women. So I’d like to keep it that way and make sure our office is in a nice, safe area. Where in Belgium are you guys? Jeroen: In Antwerp, it’s the second biggest city of Belgium and about half an hour north of Brussels. It’s the second biggest port of Europe, the diamond center of the world, and the headquarters of Salesflare — also what it is known for. Russ: Right up there in terms of accomplishments in Antwerp. Russ: The city of Salesflare. That’s awesome. Jeroen: In general, it’s not so much of a startup city, although it’s developing real fast. The city of Antwerp won a world prize last year for its public work to make Antwerp a better city for startups. So all the things they are doing, are really awesome! We actually started Salesflare here in a huge startup incubator. Actually, the first skyscraper in Europe is a startup incubator. But we have our own office space now with a few other startups, which is really nice, out in the north where the Port of Antwerp began — where Napoleon had his warships to attack the UK back in the day. Just next to that, is our office. Jeroen: Yeah. Slowly wrapping up, what’s the latest good book you’ve read and why did you choose to read it? Russ: Oh man, there are always a lot. I reread Cialdini’s Influence recently, and that was actually great. Those things are so timeless, just how persuasion happens. So I would highly recommend that. On a slightly different one, I read Bill Bryson’s A Short History of Nearly Everything recently, which is not so much a work-related book. But it is a really good book on the history of nearly everything. That is also a fun read I’d recommend. Jeroen: Yeah, it’s sometimes good to read books other than business related. To get inspiration, I guess. Jeroen: Yeah, because in the end, our jobs are broad as well. Is there anything you wish you had known when you started out? Russ: Well, I think it’s important to make sure you have enough conviction to keep working on something for quite a while, because if you’re successful, it’s going to just keep going. So make sure you have co-founders that you really trust and get along with well, because it’s kind of like a marriage. They’re always going to be big equity holders. The number of companies that explode because of founder differences is really high. Just like with marriage, make sure you pick your startup founders with care and consideration. Jeroen: That’s so true. All right then, I think I’ve gotten so much out of you already. Thanks for being on Founder Coffee, Russ. Like we do for everyone, we’ll send you over a little package of Founder Coffee in the next few weeks. It’s actual coffee, so you can enjoy that at home! Russ: Thank you and great! Thank you for having me on Jeroen. Looking forward to catching up soon. Jeroen: Absolutely. Talk to you later!